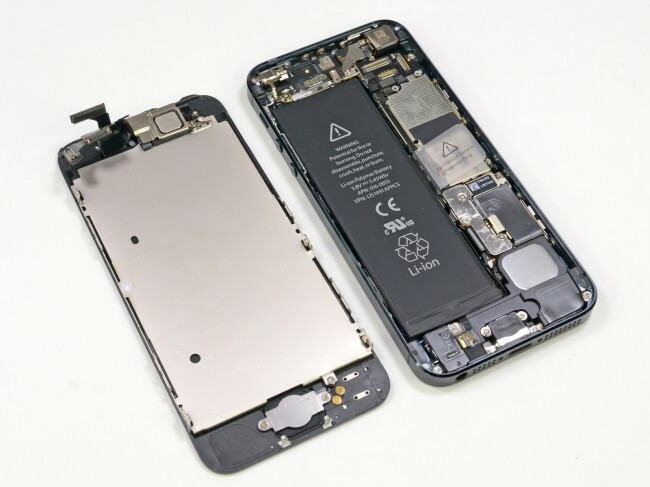 iFixit has done the traditional tear down of the new iPhone 5. The device has just launched here in the UK within the last couple of hours, but over in Australia it has already been available since yesterday due to time zone differences. The teardown revealed that to get inside you simply need to unscrew a couple of pentelobe screws and after that, use a suction cup to pull the screen off the front. This is a far better design when compared to the likes of the iPhone 4 and 4S as on those versions you had to remove the back of the device and fight through a bunch of electronics to get to the screen to prise it out. Now a screen replacement is just a matter of unfastening the screws, taking the screen off and putting a new one in place. iFixit comment that the 4S display took about 45 minutes to be replaced and had 38 steps to the process. They expect that the new display on the iPhone 5 will take far fewer steps and perhaps 5 to 10 minutes which is a bonus as the screen is something that breaks more often than the rest of the device. The battery is marked as being 3.8V at 5.45Wh and 1440mAh. This is a slight increase over the capacity and size of the 4S and manages to give about an extra 25 hours of standby time. The battery is fastened down by adhesive, so if replacing you’ll need to be aware of that. Another interesting point is that Apple has decided to fasten most connectors down with screws to prevent them gradually coming apart and rattling inside the device. As a phone is almost always on the move and being knocked about, this is actually quite a good option to keep the device more secure inside. The home button has also received a little extra help and is now attached in by a metal bracket. Many 4 and 4S users have had issues with the home button over the last couple of years since launch, so strengthening this part makes sense. Overall, I get the impression that Apple has turned attention to detail inside the device making it more secure and thus, probably meaning that less returns will need to happen. The full teardown and video guide can be found on iFixit.